New York State is a huge wine producer for the state. I don’t have any idea how well the wine competes with the other domestic wines here in the U.S., particularly California. I tend to think that New York wine is probably more favored in the Finger Lakes region (from which most of the wine is produced), but is not as popular nationally as California wines. I have tried several varieties of NY wines, and I can’t say I’ve been terribly impressed (although I do prefer domestic wines to imported, which are too heavy and spicy for my tastes). With that said, I recently tried this wine produced in Seneca Falls, NY, and– WOW! This stuff is amazing! 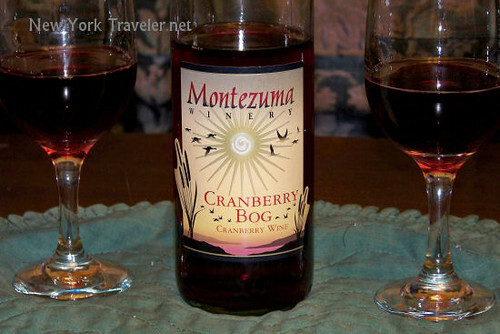 It’s Montezuma Cranberry Bog wine. “Montezuma” refers to the Montezuma National Wildlife Refuge, in Western New York and the Finger Lakes region. This wine is made from Upstate New York cranberries and is 100% cranberry wine. It is terrific wine! The alcohol content is relatively low, and the wine is sweet and smooth. I think it would be PERFECT with a Thanksgiving turkey dinner. 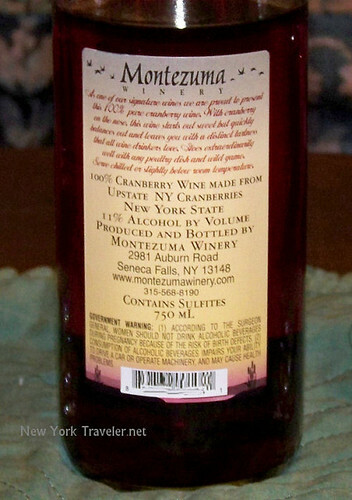 Anyway, I give the Montezuma Cranberry wine a hearty Thumbs Up! If you drink wine and are looking for something light and fruity, you might like it, too. Love, love the cranberry wine! We mixed it with your mead ( love that one too!) It was soooo gooood! I received several bottles of the cranberry for Christmas! Yippee!! !